Almost two and a half years ago, Soren Johnson did a long, in-depth interview with me and he just released the second part of it (both parts linked below). Part 2 covers the beginnings of Fantasy Strike, Yomi strategy including what to do on the first turn, a little about Pandante’s updated version, Puzzle Strike’s emphasis on player interaction, Puzzle Strike and Codex’s solution to free-for-all games, and the toughest design problems in making Codex. These are long and go into a lot of detail. We just put a new feature in Fantasy Strike that’s notable because it’s never been done before. There are now visual effects on every hit that show if you recover first, or if your opponent does. The bigger the magnitude of the effects, the longer you (or your opponent) has to act before the other player. The concept of who recovers first after a move hits or is blocked is called “frame advantage” in fighting games. The “frame” is the basic unit of time in fighting games, means a still frame of graphics shown every 1/60th of a second. So if you have +5 frame advantage after your move is blocked, that means you’ll be able to start your next move 5 frames (5/60ths of a second) before your opponent is able to start their next move. This is a very important concept in fighting games, but it's always been invisible…until now. Expert fighting game players always want to know which moves are safe, meaning which moves have the attacker recovering first when the move is blocked. 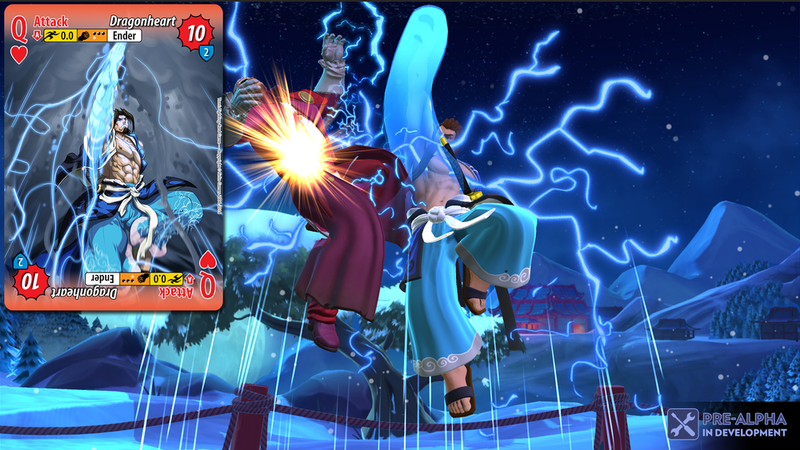 Fantasy Strike now shows that with the blue visual effects above. Good players are also conscious of “frame traps.” That term means having frame advantage (blue effects in Fantasy Strike), then attacking again and interrupting your opponent’s move if they tried to do something. For example, imagine you have a move that has 10 frames of startup, and hits on the 11th frame. Suppose your opponent has a slightly faster move that has 9 frames of startup on hits on frame 10. If you both happened to do these moves at exactly the same time, the faster one (theirs) would hit and interrupt the other move (yours). You’d be sad about that. But now imagine that you did some other move that gets blocked and leaves you at +5 (you recover 5 frames sooner than they do). Immediately after that blocked move, if you do your 10-frame startup move, you’re getting a head-start of 5 frames here. Your opponent is stuck blocking for 5 frames, THEN starts their 9-frame move. They are too far behind here and now your attack will win, even though “usually” your attack is slower. Frame advantage effects being visible all the time mean it’s more clear when frame traps are even happening. This doesn’t really take away anything because anyone who knows what they are doing already knew this. It means that beginners can play the “real game” sooner. It’s easier for them to get on the same page about what is even happening. Attacking when you are at frame disadvantage is risky, but sometimes still smart. Now it’s easier to KNOW you’re in that decision and make a conscious decision whether you want to attack then or not. That said, this feature is not just for beginners. There’s a lot of nuance in the exact timing and spacing moves that can affect frame advantage, and experts can learn about that now. For example, Setsuki can press C then B to throw a low-to-the-ground kunai, but it could give her frame advantage or disadvantage depending on the spacing and timing. Also, she has a slide attack with a lot of active frames and it could give frame advantage or disadvantage depending on the timing and spacing. Grave’s projectile has frame disadvantage from close, and lots of frame advantage from far away. There’s a particular distance where it’s exactly +0 (both players are able to do their next move at exactly the same time). That’s something you can actually see on-screen now all the time. I’m really excited about this feature and I find it useful from the beginner level all the way to the expert level. It was a technical challenge to correctly compute frame advantage in a lot of situations, and it was an aesthetic challenge to make the effects visible enough to see if you care about them, but not overly distracting if you don’t care. Try it out and see if it helps you understand Fantasy Strike more. It’s easier to wrap your mind around a game’s depth when you have the information you need to make gameplay-decisions. Fantasy Strike is currently available on Steam, here. Almost two and a half years ago, Soren Johnson did a long, in-depth interview with me and he just released the first part of it. It covers most of my career, including work on Street Fighter HD Remix, Puzzle Fighter, almost Street Fighter 4, Yomi, Codex, and FantasyStrike. We talk a lot about game design too, such as the difference between a player's perspective and a designer's, as well as what "depth" does or doesn't mean. You will even learn what a "kara throw" is in fighting games, if you don't already know. Shoryuken.com asked me about loot boxes and published this article. Any idea when this feature will be implemented? What can players expect to find? Costumes and cosmetics, right? Will there be more rare ones than others? Will there be things like victory poses, emotes, etc. ? Anything that affects gameplay? Or any other effects such as XP boosts? For example, a boost for Arena Runs? Will there be an option to use money to buy more loot boxes? There's a lot of controversy lately in the games industry when it comes to the philosophy behind loot boxes. What are the thoughts on the ongoing discussions and will Fantasy Strike have any specific strategies to not alienate gamers? Loot boxes were the plan since as long as I can remember. Our site went public in November 2016 and had all the same info then as it does now. Loot boxes were to be ONLY cosmetic. Period. Costume colors, alternate animations for non-gameplay stuff like victory poses, etc. No gameplay-affecting things. There has been controversy of loot boxes lately, yes. There is a wide range of implementation about what “loot box” means. I’d like to make it clear that at no point ever, not even for one millisecond, were we ever planning to implement any kind of pay-to-win thing. In my opinion, any supposedly competitive game that allows players to pay for power or grind for power is doing a great disservice to fairness in competition, which I think is an important value. I don’t play or support any such games. To me, THAT is what the real controversy should be, as it includes business models from big games out there, often not even using loot boxes, that ruin the concept of an even playfield in competition. Back to loot boxes, we were planning (but may now not be able to implement) them in the vein of Overwatch. That is, cosmetic only, players would get them for free over time or could pay for me. It’s not like Overwatch invented this idea, but it’s a high profile example, and one I followed very closely. Blizzard also makes Heroes of the Storm, a game that sold cosmetics directly, often for $10 each (I’m aware they switched to the Overwatch system now). I wondered, at the time, what the player reaction would be to Overwatch’s different system. So I read everything I could from players. And I do mean quite literally that I read multiple thousands of comments directly from players. Every thread on every gaming site I could find, even some hundreds of pages long. The reaction was quite clear. I found something like 3 posts that were upset, in total. And thousands all in favor. It really was that overwhelmingly one-sided. The reason is simple: in the Heroes of the Storm way, most players felt like they’d simply never own any of those cosmetics. In the Overwatch lootbox way, players get stuff for free. And they really really like that. Not only that, but they have the potential to get any (and all) of those cosmetics for free, meaning that there isn’t any class of items withheld from the boxes. So this is the spirit we were operating in, with our plans. The thing where we get to give away stuff for free and make a large number of people happy. The positives don’t stop there. Another thing true of Overwatch’s system, which is like 100x more true for us than them, is that this ongoing revenue stream is something that raises all boats for the playerbase. Every player benefits because the ongoing revenue stream allows the developer to pay for continued development, more free features and free gameplay content for ALL players. In Overwatch’s case, it means you know that new characters, maps, and game modes can be released for free, and they have been. I think it’s incredible (in a good way!) that they were able to give all players access to all characters, even new characters, without having anyone pay for an expansion or pay for each new character. It’s a case where the theory really did work out in practice, in that everyone benefited by getting free gameplay-content in addition to the part where they got some free cosmetics too. I said the above would be much more true for us than Blizzard. I don’t mean that Blizzard is somehow lying about the money involved. All I mean is that Overwatch in particular happened to be so wildly successful (half a billion dollars in revenue? Or a full billion by now?) that they could in theory decide to fund continued development anyway. Now, they might decide to really scale back on that if they didn’t have the ongoing revenue, but that’s a choice that would be up to them. It’s not a choice that’s up to us though. If we don’t have continued revenue from something like loot boxes, there is no way in the world we, as a struggling indie, can continue to pay for our team to develop new free gameplay for everyone. Like any normal company, we’d have to choose between no further content, or paid gameplay content. I’ve mentioned the ways in which loot boxes are actually good for players (free cosmetics, and free gameplay stuff too for everyone) and developers (can afford to continue development of free stuff for everyone). The recent controversy of it wall was sparked by much worse business practices than this. The whole thing about $80 for a Star Wars game then you still have to grind 40 hours to get Darth Vader really made everyone mad, and rightfully so. And let’s imagine that this made lots of ongoing revenue for EA. Does anyone really believe that the result is going to be a bunch of free gameplay content like new characters and maps, the way Blizzard would do it? I don’t think so. That sounds very not-EA to me. I don’t have much specific insight into this situation with EA games, but my sense of it, and probably the sense of most gamers on the internet, is that EA really wants to stick it to you the maximum amount, period. I think that even though both examples I’ve talked about are “loot boxes,” that there are really opposite mentalities behind them. One that is very much trying to help players. To give them some free cosmetics instead of none. And more importantly, to fund free gameplay content. Overwatch releases new characters that are completely free. As in, you instantly get them, no paying or grinding is involved. Can you imagine if Street Fighter did that? Or if Fantasy Strike did? The opposite mentality is this kind of thing basically used for evil. I’ll ask again, “Can you imagine” if EA used the money raised from loot boxes to put out new free content like a new character? The notion is laughable--I’m actually laughing right now just thinking about it--because they already went as far as possible from making Darth Vader free. I think gamers really *get* that. They get that there’s something really cynical, cash-grabby, and directly contrary to their interests going on there. Yeah that’s probably true in EA’s case. But I think Overwatch has shown that a non-evil implementation is a huge boon for players. And that’s the type of thinking we had when considering loot boxes--the intention of using that revenue to fund further gameplay development that ALL our players would benefit from. I was thinking about how we'll handle cross-platform play in Fantasy Strike. The plan is that you'll add a friend to your in-game friends list, even if they are on another platform, then you can click on them there to directly challenge them. I was looking into how Street Fighter 5 handles your in-game friends list. They went a different way with it. Below is a log of my experience. Sirlin: I'd like to give everyone some unsolicited advice on setting up your SF5 friends list. Sirlin: You might want to add someone as your friend in SF5. Or maybe you should put them on your favorites list? Or maybe those are the same thing? No, because favorites was in since launch but friends are new. So how should you start? Sirlin: In the game, you go to CFN, then the submenu has choices: blacklist, Pending CFN Friend Requests, Favorites, Replays, Rival Search, Replay Search, and Ranking. Sirlin: Keep in mind you can't read those choices all at once. You can only read them one at a time as you scroll through a horizontal list. Sirlin: "Pending CFN Friend Requests" sounds like it has potential. Maybe you can add a friend there? Sirlin: Favorites sounds like even more potential. Maybe you can add a favorite there. Or a friend? Sirlin: Ok, "Rival Search" then? Sotek: I enjoy this "advice"
Sirlin: You can choose from Refine, Search Using Fighter ID, or Search Using Steam ID. We're on the right track folks. Let's choose Search Using Fighter ID, type it in, hit enter, and see what we get. Sirlin: A list of users! Including the one searched for and others with names containing that string too. Ok click on the one you want. Sirlin: Oh sorry, mouse cannot be used anywhere in the menus. So press accept on the one you want, which is the B key, told to you no where. But you already had to know that to get anywhere near this far. Sirlin: Doing this brings up a "details menu" with exactly two items (not that detailed?). "View Fighter Profile" and "Add to Favorites"
Sirlin: damn it, I wanted to add them as a friend? Is that like not possible? It's really baiting to me add as Favorite. If you add as Favorite, then go to the Favorites menu and see them there, can you THEN add them as a friend? Sirlin: The favorites thing was a decoy. What you really want to do in the "Details menu" of two items, is choose the OTHER item, which is "View Fighter Profile"
Sirlin: Ok, we are now "Viewing Fighter Profile". It's a screen full of junk. The most prominent thing taking up most of the screen is a radar graph of how much arm wrestling, vs olympic 1st 2nd 3rd vs heart that player has. With the radar graph completely empty and non-functional of course. Sirlin: Damn, which of these tabs should we go to? zem: yes, there’s a sub menu! Sirlin: In the corner, outside of all these stats, is small help text for "Y: Sub Menu"
Sirlin: Don't actually press the Y key though. Sirlin: Press the keyboard key that corresponds to Y, which is actuallh H.
Sirlin: This brings up a sub menu that looks like the "Details List" except it's not called anything this time. You can: Compare, Add to Favorites, Send CFN Friend Request (!! ), Add to Blacklist. Sirlin: We did it folks, we found friend request. Sirlin: But what will this actually do once accepted? We already have a favorites list. So is there a favorites list AND a friends list?? Sirlin: Before we discover the answer to that, what is a "favorite" anyway? Sirlin: that's so much stuff, maybe we don't need them as a friend? Oh, but what about actually playing against them. How do you challenge a friend to a match from the favorites list? Sirlin: er, challenge a person on your favorites. Not a "friend", because you aren't friends in this example. Sirlin: You can't challenge people on your favorites list to a match. To play them you create a lobby somewhere and invite them. I won't detail that, I assume it's some other whole excruciating process though. Sirlin: If anything, that makes the friend feature more exciting though. Because you need to be able to really challenge people and favorites can't do it. Sirlin: Ok, so you send the CFN Friend Request, they accept, and now you're friends! Awesome, lets' check that friends list. Sirlin: Oh...there isn't a friends list. There's still just a favorites list? It adds them to that list, exactly like anyone else. The "friend request" just adds you to their favorites too, instead of only adding them to yours. Sirlin: So you still can't challenge them directly. Sirlin: Yeah I noticed that. I guess they are trying to prevent streaming of everyone in your friends (er...favorites) list? Like a security thing? zem: at least the buttons are labeled right though! Sirlin: I was going to close SF5, but it just crashed for the 3rd time and closed for me. Fantasy Strike is our new fighting game. We've just announced it and begun crowdfunding for it on Patreon. This podcast explains what Fantasy Strike is all about. We cover the high concept about making a fighting game more accessible from top to bottom than anything else we've seen, the specific game mechanics we chose to accomplish that, and the resulting dynamics of how it plays. Because it's unusual to crowdfund a game through Patreon, we also explain why we're doing that and what the advantages are. Hosts: David Sirlin, Richard "Leontes" Lopez, and Sean "MrGPhantome" Washington. It started out as an experiment to see if we stripped away massive amounts of stuff from the genre, would it still be fun? Even in its early prototype state, it was. Everyone we showed it to told us to keep going, so we did. And now we're to the point where we need help from all of you to finish it, so please consider supporting us on Patreon. Here's our new website for the game. Here's our new forums for Fantasy Strike. Here's our discord (text) chat server. Here's a news post explaining why we're asking for your support via Patreon. Throws used to be really powerful in fighting games, but after years of players complaining that “throws are cheap,” developers made them weaker and weaker. I think that’s the wrong way to go about things though, because powerful throws are important to prevent a game from being too defensive. So in Fantasy Strike, we have powerful throws, but we have a unique feature that means you can always get out of them if you expect them. That feature is called a “yomi counter.” To perform it, you let go of your controls. That’s right, you let go of the d-pad and buttons, and though you are completely vulnerable to any hit or combo, if an opponent tries to throw you, you will automatically reverse it. You’ll throw them instead, and you’ll do it with a fancy, awesome animation special to your character. You’ll even get full super meter on top of that. Yomi counters are a bit hard to pull off in the heat of battle, but not because they are difficult to perform (obviously!). They require a really good read, but it’s oh-so-sweet when you land them. They are hype tournament moments waiting to happen. We've kept the game under wraps for a long time, but as of today it's fine to post pictures, vids, streams, etc of the game. Just keep in mind that it's in a pre-alpha state and that the graphics quality is still not representative of the final product. We have a ton of awesome visual effects in the works already that we can't wait to add! And that's just the start. We'll add more characters, online play, more game modes, and a bunch more as we continue development. How much we can polish the game and expand it depends on how much support we get. We're totally excited about this game and our whole team is excited to get even more of you involved in our journey to make it. If you prefer to wait until release rather than take part in our crowdfunding now, that's fine too and we'll do our best to create the most polished game we can between now and then. Kickstarters projects are notoriously late. I give advice on how to ship your Kickstarter project on time. I've shipped 5 out of 5 Kickstarters on time, so it's time to share the best practices of how you can do that too. Learn about how complete your board game should be before you take it to Kickstarter, about the "magic word," and about shipping shipping shipping! While most of the episode is about Kickstarters for board games, later in the episode we cover the extra challenges of doing a Kickstarter for a video game. And we reveal that we're going a different route with our Fantasy Strike video game, which is using Patreon for crowdfunding right now.